Moving is stressful, especially when you’re crossing state lines, and the last thing you want to do is make your trip any more difficult. That’s where SMARTBOX comes in-we’re the smart choice for interstate moving. We offer completely customizable solutions for your interstate move, including storage services! Find out how SMARTBOX makes interstate moving easy-give us a call at 301-683-6111 or fill out the form on this page. At SMARTBOX, we understand that moving to a new place can be a real hassle-renting an expensive moving truck, carrying things up and down a narrow loading ramp, trying to coordinate your move perfectly, and more! That’s why we do everything we can to make your interstate move easier, including bringing packing supplies and providing moving services when you need them. When you choose SMARTBOX as your interstate moving company in Maryland, Northern Virginia, or Washington, DC, we’ll help you fully customize your move. We’ll bring as many portable storage containers as you need right to your door (or wherever is most convenient for you) and give you all the time you need packing and loading things just the way you like them. That means you can start packing for your move months in advance-and since our storage containers come equipped with an all-seasons weather-resistant cover, you’ll never have to worry about the safety of your belongings. If your portable storage containers are ready before your new home is, don’t worry! We can take your belongings to one of our secure, temperature-controlled storage facilities until you’re ready for them. Whenever you’re ready to move to your new place all you have to do is pick up the phone. 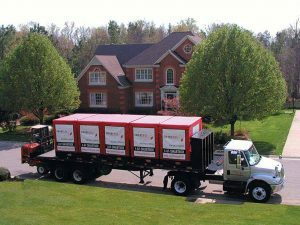 We will pick up your portable storage containers-whether they’re at your home, one of our storage facilities, or both-and deliver them to you at a scheduled time. You can always count on SMARTBOX because we’re the interstate moving company that allows you to move on your terms. Contact us today to find out more! Providing moving supplies such as tape, boxes, etc. Contact us today to learn more about our moving services in MD, VA, and DC! At SMARTBOX, we try to take the guesswork out of moving-no more wondering if you’ll get the truck returned on time or if the moving company didn’t load your belongings securely! You can even use our online space estimator to determine exactly how many portable storage boxes you’ll need for your move. Discover a new way to move by choosing SMARTBOX as your interstate moving company in Maryland, Northern Virginia, or Washington, DC! Contact us today to reserve your boxes.